UPDATE: Due to flooding in Ocean City, the start date of the 2017 Fall Rec Program has been pushed back to Thursday, Sept. 28 and will run until Nov. 11. 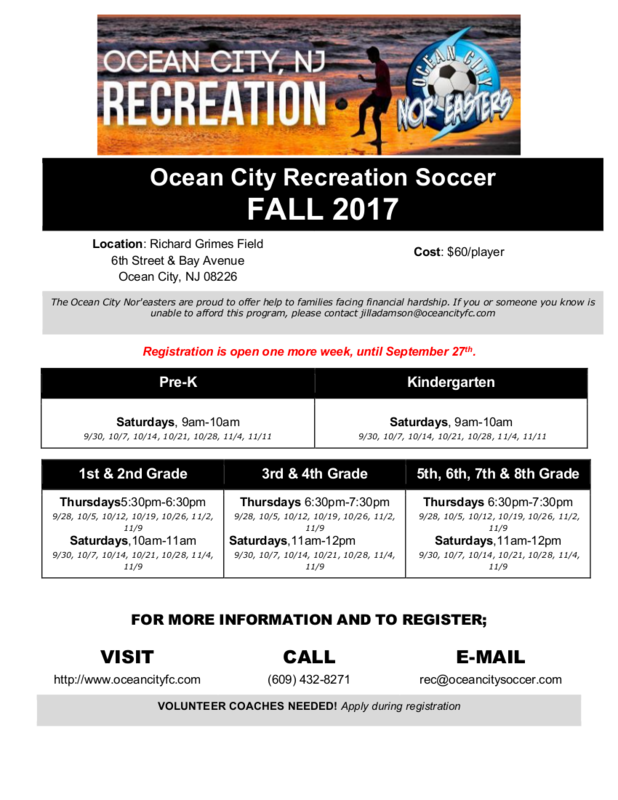 The Ocean City Nor'easters' Fall Recreation Program is back! This year's edition, which is open to all players from Pre-K up to 8th grade will kick off on Sept. 28 and run through Nov. 4. The recreation program will provide kids with a fun, age-appropriate introduction to the game of soccer from top-level coaches from the Nor'easters organization. "The Nor'easters are glad to be running the Ocean City Recreation program again this fall," said Nor'easters general manager Giancarlo Granese Jr. "The rec session will be twice a week Thursday nights and Saturday mornings and will run for a total of seven weeks. We as a club are happy to continue this bond we have developed with the children of Ocean City." "Our aim as a club is to make sure that we provided a fun environment for all kids who attend while also making sure that each participant is developing their game regardless of age and experience," said Granese. The cost of the program is $60 per child. All registered players will receive a complimentary t-shirt. For more information, please contact rec@oceancitysoccer.com or call (609) 432-8271. Registration is open one more week, until Sept 27 so please sign up soon.